Welcome to the Royal Islander Coffee and KTL Kona Coffee Farm web page. We’re at the start of another great harvest year growing the best coffee in the world at our farm in Captain Cook. Our farm is located along Mamalahoa Highway’s famous Kona Coffee Farm Belt. Everything that we do to grow 100% Pure Kona Coffee happens on our family estate farm. The “belt” is a narrow strip of land 1 mile by 30 miles long and home to about 600 farms. Hundreds of 100% Pure Kona Coffee lovers around the world visit this spot annually to visit and sample the taste. 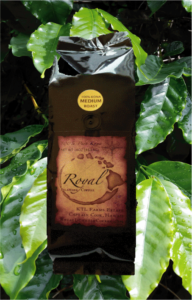 For many it is the first time they ever experienced 100% Pure Kona Coffee. We hand pick only the ripest cherry for our 100% Pure Royal Islander Coffee and process the day’s harvest on our farm. After processing, our coffee is sold farm-direct to the public with pricing that is affordable. In addition, we personally handle our own mainland distribution and shipping. We are a small operation compared to the other large coffee companies who purchase coffee cherry from the many farmers selling their harvest up and down the belt. We grow and process for sale only the cherry from our own farm. In this way we can personally insure the care and quality of our product in every step along the way to the roaster. You have chosen the best, not a blend of only 10% Kona but 100% Pure Kona Coffee. We hope you will try our coffee. We would like to stay in touch so that we can tell you about our 100% Pure Kona Coffee sales and promotions. Please use our Contact Us page. Also tell us what we’re doing right or what we can improve on. We are looking forward to hearing from you.